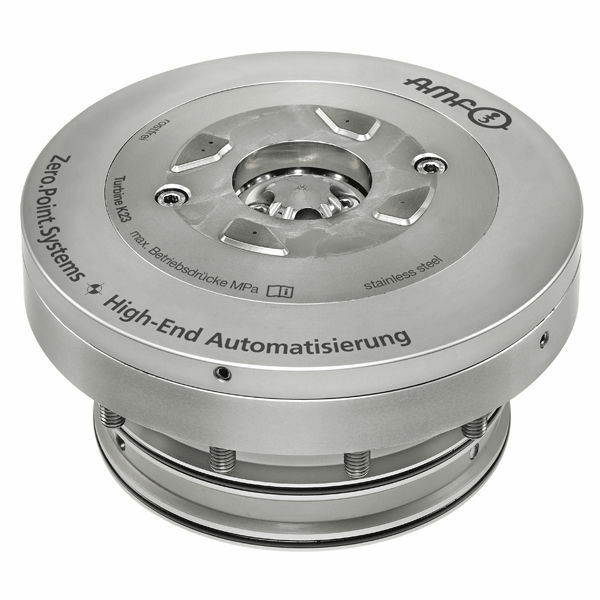 The Zero-point quick clamping cylinder is designed with a turbine, that is ideal for automated installations. This fully-automatic clamping solution is utilized for machine table support in processing centers, with automatic pallet changing system. This device is also ideal for loading and installing pallets, and for clamping brackets and cubes. It is made with a hardened support surface with an integrated support control. An additional blowing-off of the support surfaces made by the centrically running-out turbine spindles can also take place. Also, a 6 mm lift-out of the pallet can be changed for more convenient pallet removal. The device is further enhanced by a pneumatic support control and by a hydraulic locking control.